From around the world we researched the top trends in Home Design and came up with our own list approved with the #AlkaStyle stamp to bring the indoors to your outdoor living space. Photo courtesy of View Point Construction Ltd. This year the old adage of less is more rings true but with a twist. The style is simplistic but not minimalist and this way your eye is drawn to a special feature of the space. Why not follow this trend and let your swimming pool be the jewel of your outdoor living space? The relationship between mankind and nature, known as Biophilia, has taken a forefront in the minds of designers. These types of spaces promote calm and improve your overall well-being. They are known to reduce stress and at the same time enhance creativity. You’ll see colors that blend with the outdoors, more lush foliage of all kinds, and environmentally friendly products. Your sense of smell and sound are also put into consideration with the calming scents of lavender and lemon verbena, coupled with the sounds of a soothing waterfall. Though we found this trend was for fabrics and wallpaper, we took it one step further with this floral accent inside the swimming pool. A subtle design that makes for an eye catching work of art and a unique focal point. Rich jewel tones are a must this season. From sparkling sapphire to shimmering aquamarine, or perhaps bold lapis lazuli is more your style; the hue of your swimming pool can be tailored to your desires with a custom blend of colored plaster. Add accents in the form of pillows and umbrellas in the Pantone Color of the Year – Living Coral – a perfect complement to these jewel tones. An interesting trend we found was the addition of wood accents in a darker palette and thicker almost “chunkier” adornments. With the addition of an ironwood deck you can create the look and feel of a lakeside retreat for your outdoor living space. Keeping with our eye catching focal points, bold patterns have come back in style. The key is to make them the focus of the room and leave the rest of the space mellow and low-key. 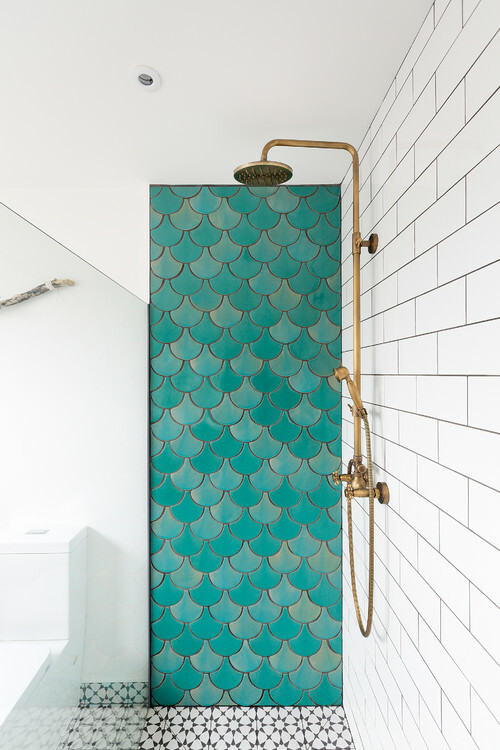 A great example is the mermaid tile. A bold funky pattern that can be enhanced with the use of metallic grout to create a whimsical atmosphere, whether you use it as an accent or the main tile for your outdoor living space. Setting the stage for a dramatic effect can be accomplished with bold and bright LED lights. The use of this high drama lighting can aid to feature a treasured item or pull the eye towards the chosen focal point. Adding colored LED lights to your swimming pool creates a beautiful canvas that can change the mood of the lounge area at the flick of a switch. Comfort is back in style. We have moved past the attitude that style is King regardless of comfort. Now our comfort takes the front seat, as it should. This doesn’t mean, however, that you can’t have style too. We see this in homes with additions like whirlpools, cold pools and even a whole therapeutic spa retreat. This brings an extra level of luxury and comfort. Getting things just right even if you spend a little extra is incredibly gratifying in the long run because the more it suits YOU the more you will use your investment. Blending both is the ultimate trend in 2019. Add some #AlkaStyle to your outdoor living space today!